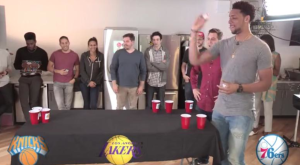 Jahlil Okafor plays beer pong to determine which NBA team he will play for. The NBA draft is scheduled to begin at 7:30 ET on June 25th, and consensus top two pick Jahlil Okafor has recently taken to the beer pong table to hypothetically determine his professional basketball fate. (While the table used does not appear to be regulation size, this is a method of decision making that we at BPONG.COM completely support!) Armed with a table tennis ball, similar to the ones used in the actual draft, the 6’11” Center began eliminating possible teams one shot at a time. He was eventually faced with a two-rack consisting of Philadelphia and New York. The Duke University athlete intentionally eliminated (we’d like to assume) the 76ers pronouncing the Knicks his team of choice. Okafor claimed to have never participated in the game before (roll eyes), as it would have been expected for there to have been beer in the cups if so. Little does he know, that if he were to step up his game and play on a professional level, utilizing official World Series of Beer Pong rules, there is no drinking required. When it came to his natural beer pong talent, Jahlil Okafor showed strong form while consistently making the cups he had aimed for. Just imagine how much more promise the 19-year-old could show if he was leaning over the table, a legal maneuver in the professional circuit. Certainly his 89” wingspan would aid him in any future participation in the game we love so dearly. However, his height and length would not even be his greatest strength in beer pong. His competitive nature and mental toughness has already been tested through his years of high level basketball. If Okafor can perform on the court in a national championship, with thousands of opposing fans maliciously berating him, the foul words of a beer pong opponent defending him should have little effect. Seeing Jahlil Okafor grace the tables of a BPONG event would certainly be a dream for many players and organizers alike. Considering the addictive nature of this game and the amazing community, we’re sure his first event would absolutely not be his last. And one last thing: Jahlil, could you please have a conversation with Sir Charles Barkley on our behalf since he said that “black people don’t play beer pong”? Not only was he clearly wrong, you chose the sport of beer pong to help make the important determination of where you should hypothetically land in the NBA, which was a great choice, by the way. Check out Bleacher Report to watch Jahlil smash cups before he walks across the stage and shakes Adam Silver’s hand on draft day.